MAGIC is a word thrown around a lot, perhaps even a little too much. 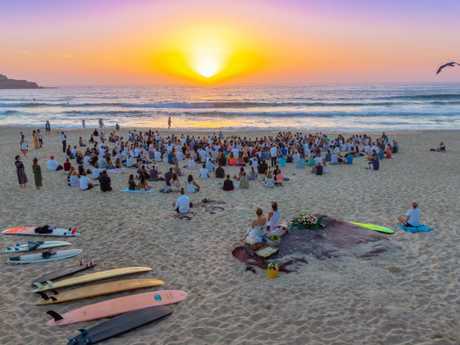 But this morning, as hundreds gathered on Bondi Beach to say goodbye to Annalise Braakensiek in their own special way, the scene was truly magical. It was a word the radiating model used a lot, so it was only fitting it became the theme of her memorial. 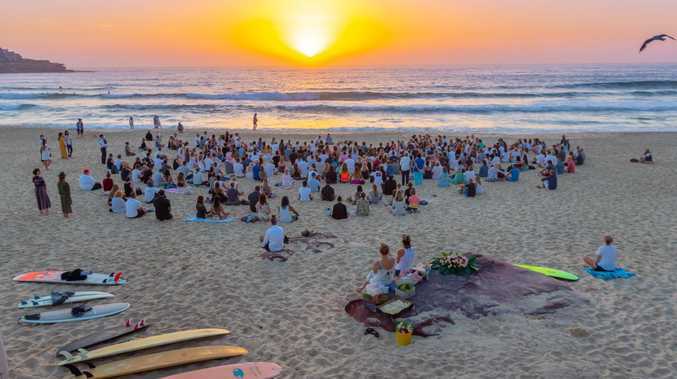 As the sun slowly rose over the horizon, the group sat silently on the sand meditating before offering Annalise's favourite sweet-scented frangipani flower to the ocean, with surfers then taking a wreath out to sea to the rhythmical beat of drums. Recreating one of Annalise's favourite things to do - meditate and swim in the Sydney ocean that was her local playground - tears seemed the most appropriate place to fall into the salty water with flowers. Organiser Veronika Beck created this morning's tribute with a quote from Coldplay song Magic. "And if you were to ask me after all that I've been through if I still believe in magic? Yes I do. Of course I do …"
She said they were lyrics Annalise often included on her social media posts. The designer's Instagram posts are filled with the word, accompanied with star emojis and everything that shined bright in her life. The lyrics actually use the words "after all that we've been through" and when you listen to the song you can't help but think that for Annalise her love of the song was also a reference to her relationship breakdown with husband Danny Goldberg. The split in April last year after 16 years together left her "twisted" and "upside down", which she eluded to her recent posts. Yet despite whatever pain she felt, the long-time Bondi local had said, "We still have a lot of love for each other and will remain good friends". Often that's hard to fathom through heartbreak but this morning Danny stood front and centre during the tribute, leading the prayer supported by family and close friends. Danny took the frangipani wreath out to sea on jetski with the help of Bondi lifeguards who also ferried surfers out who couldn't quite battle the waves. He didn't want to say anything to media this morning. The 46-year-old model was found dead in her inner-city apartment on January 6. Several people spoke about that this morning, pointing out the model's death was accidental despite reports suggesting she took her own life. Everyone knew she had been through "dark, challenging and demanding" times, speaking out about her depression and being an ambassador for R U OK?, but they also said "she was getting there" and had been full of laughs. Many were helping her, particularly with her successful jewellery lingerie line and places to stay, and had spoken to her only days before they found out about her death. They took comfort in sharing with each other that Annalise's death wasn't intentional. Ms Beck said no one would know that until they had the results of the autopsy report. Just two months before Annalise was found dead, she shared a post for R U OK? thanking those in her life who had supported her. "Thank you from the bottom of my heart to all of you who have helped me though my dark clouds … now I'm strong enough to help my loved ones who unfortunately are not in the best place right now," she wrote with the image. "But we will get through this! I love you and am your rock … I will never let you down. I am always here." 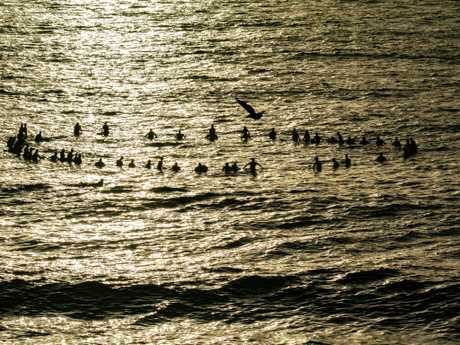 And many thought she was there this morning, spending Bondi the magical love she spread during her beautiful life. Annalise loved being by the beach, particularly her favourite local spot Bondi.